2.2 Were Meier’s space pictures ever falsified? 2.2.1 But then why did Meier recall his space pictures in 1970’s? 2.3 How reasonable are the claims made by Meier on his Space and Time Travel pictures? On our website, we have documented the investigation and analysis so far carried out by ourselves and others, concerning at least 57 of Meier’s pictures of which he, at one time or the other claimed and still claim to have photographed during his space and time travels supposedly undertaken in the years 1975 and 1978 respectively. In 1975, Meier allegedly made two journeys in space. One journey, referred to as his ‘Great Journey’ lasted 5 days between July 17 and July 22 (narrated in the Contact Reports 31, 32, 34 & 35) where he allegedly travelled to many planets, stars, galaxies and even to a parallel Universe. On his second journey that took place on December 3 (narrated in the Contact Report 39) lasting 2 days, he visited three planets that existed in a different dimension. In addition to the above trips, Meier on March 18, 1978 (narrated in the Contact Report 104), also allegedly made a time travel trip to an unspecified time into the future when the San Francisco city is destroyed by the long-predicted (by scientists) mega-earthquake. According to the information from FIGU Special Bulletin 20 (2005), Meier allegedly made more than 1,378 pictures during his Great Journey, of which 1,336 were falsified by the MIB (Men In Black) and others, and only 421 among them, which the Plejaren ET Ptaah allegedly verified and authenticated in around the year 2001, are considered to be either genuine or almost genuine by virtue of slight falsifications. The falsified 1,336 pictures, Meier claims, have been destroyed by the Plejaren in the 1970’s. And 31 out of these 42 pictures have been published in 3rd edition Contact Report books – Plejadisch-plejarische Kontaktberichte Block 1 (2002) & Block 2 (2003). So based on the information from the FSB 20 (2005) and also from the FIGU co-founder and Core Group member Guido Moosbrugger’s book Und sie fliegen doch! (1991/2001/2004/2012), Meier as of today considers 532 out of his at least 1,389 pictures3 from his space and time travels, to be either genuine or almost genuine pictures. And in our investigation, we have not only addressed pictures that Meier may or may not consider genuine today, but have also addressed 36 pictures from the above total of at least 53 (or 61?) which he, to this day, unequivocally contends to be either genuine or almost genuine. We shall now summarize the critical findings made so far on Meier’s space and time travel pictures, that have been addressed by us and others. Discrepancies6 between the optical characteristics of the Meier’s camera and the focus features in his developed pictures. Curved-edge in most of the Meier’s photos strongly resembles the curvature of the standard color television monitors (Ex: CRT) from 1970’s. As a side note, in the photos that have been authenticated by Ptaah as genuine in around 2001 and published in Plejadisch-plejarische Kontaktberichte Block 1 (2002) & Block 2 (2003), this curvature somehow is missing, wherein, it was evident initially. Furthermore, we have provided a list of 30 Great Journey pictures, that have yet to be analysed and/or their most-likely terrestrial sources identified. Out of these 30 pictures, Meier (FSB 20, 2005) considers at least 16 of them to be certainly genuine or almost genuine. Contrary to most of the investigated pictures, the nature of the content of these remaining pictures leaves hardly any possibility to ever prove their authenticity. They could only be proven not authentic if identical alternative terrestrial sources were to be found. But based on the conclusions drawn thus far from analyzing the 57 pictures, the chances that these 16 or 30 pictures being genuine is extremely unlikely. Were Meier’s space pictures ever falsified? CR 39, 1975 (1978/1987/2003) – As a part of their mission, extraterrestrials send intuitive-telepathic impulses to the Earth human beings, in particular artists, scientists and authors, in order to slowly prepare them and for the coming events, cognitions, and forms and also to give them the drive for development. According to Meier/Plejaren, this is the reason why his pictures of an ET spaceship from another dimension are identical to a spaceship from a German sci-fi TV series. Stimme der Wassermannzeit Nr. 6 (January 1976) – Meier instructs K. Locher, a physicist from the Schweizerische Astronomische Gesellschaft (Swiss Astronomical Society) or SAG to visit and inspect his ‘photo material and different original films’ after he was criticized by the physicist on his Horsehead Nebula and Pleiades picture that turned out to be identical to observatory pictures. CR 66, 1976 (1979/1988/2003) – Artists came in the possession of Meier’s pictures – Venus, Mars, Jupiter, Universal Barrier, etc. – and made very accurate imitations of his images in order to make drawings for research and future demonstrations. CR 68, 1976 (1979/1988/2003) – Intuitive-telepathic impulses sent by ETs have led artists to render images that are similar or identical to Meier’s photos, after and in some cases before Meier photographed them in July 1975 (BMUFOR note: so far we haven’t found one similar image that was published only after Meier’s pictures were published). CR 106, 1978 (1980/1988/2004) – The Baawi ETs, allies of the Plejaren ETs who are responsible for sending intuitive-telepathic impulses, made a mistake by sending impulses regarding the future San Francisco earthquake destruction one year before it was photographed during a time travel and published by Meier in 1978, which turned out to be similar to a painting by the artist that received the impulses. Und sie fliegen doch!/And yet they fly!/And still they fly! (1991/2001/2004/2012) – Billy’s space pictures have been ‘altered and shown on TV without naming their origin or the changes.’ They were also ‘used to make deceptively similar, though somewhat altered reproductions in order to represent future Earth technology.’ Baavi ETs who had a ‘mission to relay several very special pictures, identical to Billy’s space photographs, to certain sensitive Earth artists’ had unfortunately partially transmitted these before Meier’s space photos were publicized by him. Above references evidently point out that all those Meier’s space and time travel photos that are eerily similar or identical to the images rendered by artists were considered (unfalsified) originals and attributed by Meier to either Baavi ETs intuitive-telepathic impulses or to the artists who copied and altered his images “illegally” without his consent. These “facts”, according to Meier and Plejaren, the ‘earth human should at least think logically…’ (CR 68), which they claim, have failed to do so. This could likely be the reason behind what was being said above in CR 239 (more on this subject later). Therefore, at least up to early 1990’s, there is nada in the contact notes mentioning about these photos being fabricated or switched with counterfeits by any kind of organization (ex: MIB) or person(s). On pg. 155 of Meier’s Aus den Tiefen des Weltenraums book published in 1997, instead of saying anything exclusive on space and time travel pictures, he cursorily mentioned – regarding his overall photos that count up to more than 3,500 representing space ships, landing tracks, alien worlds, Apollo-Soyuz docking etc. – that during the course of years, all these were stolen and many of them have been manipulated, in order to be able to accuse him of swindle and of fraud. It is not clear, if he meant that his space pictures have also definitively been tampered with or not. But on June 30 of the same year, in response to the allegation of hoaxing his Pteranodon photo as alleged by the critics, Meier wrote a letter to his supporters Heidi and Bob (from USA) stating that Semjase and Quetzal have long ago warned him about the falsifications of his Great Journey photos in 1970’s. He even stated that Quetzal, who after realizing that several among the hundreds of space photos have been ‘maliciously falsified or were even imitated from the ground up and became falsified…’, took away all of Meier’s slides, negatives and films from his collection and destroyed them because he became ‘furious’ after knowing that a large part of photos have been deliberately falsified and distributed in order to discredit Meier. Intriguingly, in the letter and also in the Ptaah’s response to it on February 3, 1998 (CR 260), there was no mention of MIB or the evil ETs that allegedly used to reside under the Gizeh pyramids called as Bafath who, Meier claims, are desperate to either assassinate him or discredit him and his mission. One could argue that Meier only came to know about the role of MIB and Bafath to the falsification of photo material after7 the Asket-Nera photos exposé in May 1998 (CR 264). And this could be the reason why Meier in the preceding contact reports never mentioned the MIB in relation to the falsification of photos, but only in relation to the various alleged assassination and kidnapping attempts of Meier and his children. But then according to the Ptaah’s own information from the same CR 264, Ptaah must be totally aware of the role of MIB and Bafath since 1984, yet for some reason in CR 260 (Feb 3, 1998) he didn’t mention their names either. Instead, he just mentioned the name of the photographer Schmid (along with ‘several other people at home and abroad’) whom Ptaah says played a very active part in falsifying Meier’s photos8. But this is again in contradiction to Ptaah’s own revelation from 1984 (CR 264), when he allegedly conveyed to Meier that the photographer Schmid was not working on his own but has been coerced by the MIB to do the manipulations. Putting these discrepancies aside for a moment, one can’t help but wonder why this crucial information on the falsification of photos, which Meier maintains to have known since the beginning, wasn’t published in 1970’s itself or even shortly thereafter? Why did Meier wait for more than two decades to reveal this important information and only in response to the allegation of hoaxing his Pteranodon photo (CR 260)? Also on pg. 133 of Aus den Tiefen des Weltenraums, Meier claimed that he doesn’t possess any of the original slides, negatives and films anymore because – of an ex-FIGU CG member and a private photo laboratory (names not mentioned) – who temporarily were in the possession of his original photo collection returned only copies and falsified a large amount of his photos. However in CR 384/FIGU Special Bulletin 20, other than blaming MIB and Schmid, Meier for the FIRST TIME claimed that his ex-wife (Kalliope, divorced in 1997) along with other ex-FIGU Core Group members – H.S.9 (most likely Hans Schutzbach, who left FIGU in 1979; SWZ Nr. 42, pg. 12, March-May 1982) and M.S. – who left FIGU in 1970’s had a role in ‘manipulations in the film, slide, negative, and photo material’ and which according to Meier ‘can be proven.’ Meier also claimed that these four persons profited exorbitant amounts of money by trading his falsified material, which fact was allegedly realized by him only in the 1990’s through Michael Hesemann. To date no evidence has ever been put forth by Meier or FIGU to support any of their above allegations. One wonders as to why did Meier only claim – after more than two decades and that too after getting divorced from Kalliope in 1997 – that she along with other ex-FIGU CG members were involved in the manipulation of Meier’s material evidence. We have contacted Methusalem Meier (son of Billy Meier, who has distanced himself from FIGU) on April 22, 2015 and also Kalliope on Nov 14, 2014, but so far they haven’t responded to these accusations. All of the above data strongly indicates that at least up to the year 1996, there is no evidence of Meier claiming anything about his space and time travel pictures being falsified by MIB or Bafath or other nefarious parties, for the purpose of discrediting him and his mission. In fact, all the evidence points to the notion that at least up to 1991 and perhaps up to 1996, Meier apparently considered his space and time travel pictures to be untampered originals. It seems, only in 1997 did Meier for the FIRST TIME publish that his pictures have been falsified by several people worldwide. And only in 1998, did Meier for the FIRST TIME claim that MIB (and Bafath) was extensively involved in the falsification of most of his space pictures. Now according to the information in CR 384/FSB 20 (2005), Meier and Plejaren claim that 31 out of the total of 42 genuine or almost genuine photos have been published in the 3rd ed. Plejadisch-plejarische Kontaktberichte Block 1 (2002) & Block 2 (2003). These photos, they say, have been ‘strictly ensured’ by the Plejaren ET Ptaah in around 2001, to contain only Meier’s ‘real..shots’, implying that he has verified and authenticated all the 42 of Meier’s photos. But our investigation has revealed that, at least, most of the nearly half of the 31 photos are either certainly or most likely correspond to the images from diverse sources, as mentioned in the beginning of this page. Not to mention, the rest of the 31 photos (which appear in black and white in the link) also look very dubious. Even before this so-called “authentication” by Ptaah in around 2001, Meier and FIGU has been promoting and defending some space photos – Apollo-Soyuz, Horsehead Nebula, Ring Nebula, Universal Barrier and Orion spaceship – (along with Asket-Nera up to 1998 when they were finally revealed to be fakes by Kal Korff) from his supposedly genuine 42 set, as authentic since 1975. Were these photos authenticated? If yes, then by whom? Even today, there is no information in contact notes on these photos ever being authenticated by anyone, yet they have been published and promoted as being genuine since the beginning. As it turns out these photos have already been long ago demonstrated to be images from terrestrial sources in around mid-1970’s and also between 1980-81. One can’t help but wonder, how come these and other space photos that are definitively fake, still exist in Meier’s collection (PPKB 1 and 2) even after having been inspected and verified by the Plejaren ETs Semjase and Quetzal in 1970’s and again by Ptaah in around 2001. The obvious implication of this, after considering all of the above information, is that there likely never was any deliberate, calculated sabotage of Meier’s space photos intended by any sinister persons or parties such as MIB, Bafath ETs, Meier’s ex-wife Kalliope, ex-FIGU CG, etc., as alleged by Meier and FIGU. These findings calls into question the truthfulness and veracity of Meier and FIGU’s claims on the whole case, especially their claims of the deliberate falsification of Meier’s beamship photos and films by MIB and others, not to mention the alleged multiple assassination attempts on Meier and his family attributed to MIB, Bafath and other evil-ETs, etc. When you fake a film by means of a double exposure with non-professional materials, some bad sequences are generated with poor contrast and light quality which will have to be eliminated. In 1978, Madeleine Rodeffer explained to UFOlogist Timothy Good how she had been disappointed when she saw the film for the first time, the film that Adamski had taken, and that she had agreed to endorse it as if it had been taken by her (in order to be more credible). Madeleine told Good that the film looked so strange that it couldn’t be the original one she had been shown by Adamski. She explained to Good that the first film looked so obviously faked that it was found impossible to show it in that state. Adamski himself seemed disappointed with the film. He explained to Madeleine Rodeffer that maybe he had filmed the shadow of the scout ship rather than the craft itself. Of course, this sounds completely foolish as if a shadow could be mistaken for the real thing. The film probably looked unconvincing because of the double exposure. Madeleine, who knew nothing about photography and the camera, believed Adamski who finally suggested that government agents in the developing laboratory had made a copy of his original and inserted fraudulent images in it to discredit him. What an extraordinary explanation! But then why did Meier recall his space pictures in 1970’s? If Meier didn’t consider his space pictures to be hoaxes, at least up to 1991 or perhaps up to 1996 as suggested above, then what would be the reason for him to recall them in 1970’s? According to the Ufologist Ray Stanford, it Meier allegedly reported for the first time in 1978 that his space and time travel pictures have been recalled by the Plejaren/Pleiadians and were supposed to be destroyed. Presumably after coming to know about this recalling of photos by Meier, Wendelle Stevens has removed10 some of the space photos from the final version of his book UFO Contact from the Pleiades: A Preliminary Investigation Report published in 1982, which otherwise were present in the 1978 draft edition. What could be the reason behind this recalling? The exact reason for the recalling of these space pictures, either deliberately or not, apparently wasn’t mentioned by Meier or FIGU in any of their books or articles since 1978 and as we have seen above, only did for the FIRST TIME by Meier 19 years later in a letter (CR 260) addressed to his supporters Heidi and Bob, dated June 30, 1997. How does this “new” explanation weigh with the reported facts from the past? False allegations have been made by people who doesn’t know the “fact” that some of the pictures in Meier’s photo albums are really terrestrial observatory pictures that have been mounted there by Meier’s friends for illustration purposes, and according to Wendelle, these were never claimed by Meier to have been photographed by him during his travels (BMUFOR note: This Wendelle’s claim turned out to be false; see Planet Venus, Ring Nebula and Horsehead Nebula). Another possible reason could be the one that was stated by Semjase in CR 68 (and perhaps may be the reason behind Ptaah’s statements from CR 239, verse 40 – ‘people and the times have not yet changed sufficiently, that we could allow these pictures to be published, either in small circles or in the large public’ ), where she claimed that the Earth people are being unreasonable and thinking illogically, for not considering the reasons (ET’s intuitive-telepathic impulses and artist’s copying and altering Meier’s pictures) given by Meier, on why his pictures were very similar or identical to the images of various artists. How reasonable are the claims made by Meier on his Space and Time Travel pictures? All of Meier’s slides from Great Journey have been ‘greatly falsified’ by fallible ones. Because when Quetzal took and examined a bunch of slides, he found all of them have been maliciously manipulated. And these manipulated slides, according to Quetzal, turned out to be images from a science-fiction futuristic film that was allegedly produced by their intuitive-telepathic impulses on the Earth containing planets, suns, humans, apparatuses, dinosaurs, and plants. Soon after the freshly developed 1,378 pictures from Meier’s Great Journey were in the hands of Meier, these were then seen, inspected and ‘discovered very quickly’ by Quetzal that 1,336 pictures have been manipulated. But the FIGU co-founder and Core Group member Guido Moosbrugger already came into the possession of these pictures and has promised Meier never to make the copies available to the public or to get rid of these in any way because the falsification from a foreign hand was also among the preserved photos. Billy trusted the photographer Schmid and probably didn’t assume that he would be deceived; therefore, he also didn’t check the photos individually for any manipulations. Meier, already at the beginning of his contacts with the Pleiadians/Plejaren, received false slides, negatives or manipulated photos back from Schmid unnoticed. This photographer has passed away in the meantime and, therefore, is no longer able to provide any information at all on these machinations. Apart from MIB who forced Schmid to work for them, Meier’s ex-wife Kalliope and other ex-FIGU CG members Hans Schutbach, Konrad Schutzbach and M.S. were evidentially involved in the manipulation of Meier’s film, slide, negative, and photo material and made exorbitant amounts of money in trading them. In the year 2001, Guido was asked by Meier to make some of the photos available for publication in the corrected 3rd edition Pleiadian/Plejaren Contact Report Block. For the publication in the Contact Report Block, it was strictly ensured, with the help of Ptaah, that it only concerned Meier’s genuine pictures or his pictures that were only slightly falsified by Schmid, whereby the aforesaid falsification, for a logical reason, found no use. The space pictures published in the new 3rd ed. Contact Report Block contain only a few copies of the real 42 shots, to which only very few falsifying and not any major changes were made. On the topic of falsified space photos, in CR 236 (1990), verse 303, Ptaah seems to speak of one futuristic-film (science fiction film) which was made from Plejaren impulses, from where all or almost all of the manipulated space photos – Planets, suns, humans, apparatuses, dinosaurs, and plants – came from & were used by MIB & Schmid. If it is true, then what is this science-fiction movie (name & year of release) ? 303. Ja, diese wurden durch die Machenschaften der Fehlbaren ebenfalls stark verfälscht, und zwar alle, denn unter allen jenen, die Quetzal an sich genommen und untersucht hat, fanden sich keine, die nicht bösartig derart manipuliert wurden, dass sie letztendlich Aufnahmen gleichkamen, die einem Zukunftsfilm entsprechen, der durch unsere Impulse auf der Erde hergestellt wurde. 303. Yes, those were greatly falsified by the machinations of the fallible ones, and I mean all of them, because out of all those that Quetzal took and examined, there weren’t any that weren’t maliciously manipulated, and they ultimately turned out to be shots that correspond to a future film that was produced by our impulses on the Earth. Meier said that he shot 5 rolls of 36 frame color film of and aboard the mother-ship during his visit to it, but that all but one of them was “lost” between him and the photo processor and back. They have never turned up. Eduard Meier took five 36-shot rolls of film during this trip and only one of them was ever returned to him from the photo processors. The rest are “lost” in handling. If only one of the 5-rolls were ever returned to Meier as was suggested above, then Meier would only get 3612 photos from his Great Journey, which is nowhere near the ‘several hundred’ or 1,478 figure provided by Meier only in 1998 and 2005 respectively. This ’36’ figure also doesn’t match with the ‘more than 60’ figure cited by Kal Korff on pg. 248 of his 1995 book – ‘Spaceships of the Pleiades.’ In an article posted on Michael Horn’ site, Meier allegedly took about 700 space photos. So, which number is right? And why is there a discrepancy in such a simple issue? So far there is no available evidence to suggest that Meier ever took several hundreds of photos during his Great Journey. When exactly were these space pictures destroyed by Quetzal? However, the criteria used to select the photos is unknown to me. In Contact Report 68 (Nov 1976), PPKB 2, pgs.378-, you and Semjase were discussing the fact that some space pictures that are very similar to yours (which you photographed in mid-1975) have been shown on TV in 1976; and the accusations that you photographed them from TV. Also according to the same contact report, some artists/painters have already in much earlier times to the time you photographed (July 1975), have painted some identical illustrations and published them before you did. When you asked Semjase why she allowed you to publish your photographs that are very similar or in some cases identical to the illustrations made in earlier times, she said that you would come to recognize the importance of the publication of these space pictures in the course of next year, which is 1977. ..But tell me: is it really so damn important that I have to disseminate these images, which already were made in oil or otherwise and published by gifted sensitive painters in times before? 44. It was very important and it still is, but it wasn’t calculated in our probability calculations that certain groups would react that negatively. Then I am simply the fool now. You could have inform me on these things, then I would never have disseminated the pictures. 45. I knew that, that’s why I wasn’t allowed to say anything. 46. It had to be this way, you will experience in the course of the next year why. 47. I cannot change it. Ok, ok, never mind then. Assuming you came to know the reason in 1977, can you tell us why was it so important to publish your space photographs that are very identical or similar to the ones that were already published by artists/painters before ? Billy was allowed to make all of his photos to trigger a controversy in the ufological field and beyond, so people would get attentive to the story behind the photos. He does not remember the special reason for Semjase’s statement (1977). All of the above critique strongly suggests that the claims made by Meier on his space and time travel photos are not only dubious and improbable, but in some cases impossible. And the explanations given by Meier and FIGU are replete with many discrepancies, contradictions, omissions and inconsistencies, which makes it almost impossible to reconcile with the facts or overlook them. Now, the first most important and the million dollar question is – Did Meier hoax his supposedly “genuine” space and time travel pictures, at least some of them? It is an indisputable fact that there are several dozen obvious fakes in Meier’s collection of space and time travel pictures and even among the relatively recent (~2001) ET-authenticated 42 pictures. Even though the convergence of all the cumulative evidence so far discussed, beyond a reasonable doubt, apparently point to Meier as the perpetrator behind these crude hoaxes, one can’t prove with certainty that Meier himself did it. The second most important take away question is – Has Meier ever been in contact with ET’s, especially when reckoning with the fact that he has several obvious fakes in his collection? Being the most documented case spanning many decades with several categories of evidence, it would be technically speaking, premature to conclude anything regarding the authenticity of Meier’s contacts with ETs from just one set of evidence. Nevertheless, considering the claims made so far by Meier regarding the nature and the purpose of his contacts with the ETs and his mission, it is inconceivable and baffling that a supposed genuine ET contactee would not only retain several dozen blatant fakes in his collection but vigorously and persistently defend them against the decades of legitimate and valid criticism. We are not the first ones to do an exposé regarding the dubious nature of many of Meier’s counterfeit space and time travel pictures, that were and still being published and promoted by Meier as genuine photos since mid-1970’s. There have been several occassions where professional skeptics, scientists and others have identified the true (terrestrial) source of Meier’s photos since the beginning. But most of the responses by Meier, FIGU and their supporters to their critique including ours has been more or less the same all through. There have been many instances where their responses can be interpreted as not only being evasive and pseudoscientific but also appear to be attempts at downplaying the significance of the counter-evidence or rebuttal. Did we miss argumentum ad hominem? Hi Michael, and other forum members. Upon discussion with Christian and the other Forum Moderators the photo comparisons topic has been terminated. People who are eager to discuss this topic may do so in other forums. Billy never falsified photos, so there’s no need to follow such useless discussions any longer. What is written in this link is still valid. So, any interested person wanting to debate or confront Meier/FIGU with the fake space and time travel pictures issue would likely be sorely disappointed. Anyway, below we shall try to illustrate briefly with three examples of how Meier and FIGU, especially Michael Horn usually responds (whenever they do). For more such examples, refer to our analyses conducted on each set of space and time travel pictures. One striking example reflecting the attempts of whitewashing and downplaying is the article – The Billy Meier Space Photos Controversy – published by the Authorized American Media Representative for the Billy Meier Contacts, Michael Horn in August 2014. He published his article in response to our analysis of Meier’s Apollo-Soyuz photos, where we have conclusively demonstrated that almost all of these photos – which allegedly have been verified and authenticated by the Extraterrestrial Ptaah in around 2001 – perfectly match with the images of a mock-up model and frames from the Soviet films and NASA simulated animations broadcasted several years before Meier’s space journey in 1975. How did Michael Horn respond to this incontrovertible proof? FIGU had for some time given its approval to the use of the photos and considered them genuine, or only slightly manipulated or falsified by other parties. However, they later considered them all to be suspect and unreliable. So an issue apparently arose for a couple of people who were very troubled that they still appeared in print, apparently with FIGU’s approval. Furthermore, in the article, Michael defends Meier/FIGU’s “mistake” – of ONCE AGAIN being duped by CIA, MIB, etc. and getting to promote these counterfeit pictures as real ones – by asserting that these Plejaren ETs, who allegedly are said to be 8,000 years ahead of us in the fields of science and technology and 30 million years ahead of us spiritually, are not ‘all-knowing, immune to any mistakes, flawless, etc.’ and, as very improbable and inconceivable it may seem from the context, must have somehow goofed up in the process of detecting these crude and easily discernible hoaxes. The main problem with Michael Horn’s response is that, contrary to his statement, Meier and FIGU, even TO THIS DAY, assert that the pictures published in the PPKBs (2002 and 2003) and the Und sie fliegen doch! (1991/2001/2004/2012) books to be REAL PHOTOGRAPHS taken by Meier during his space travels. 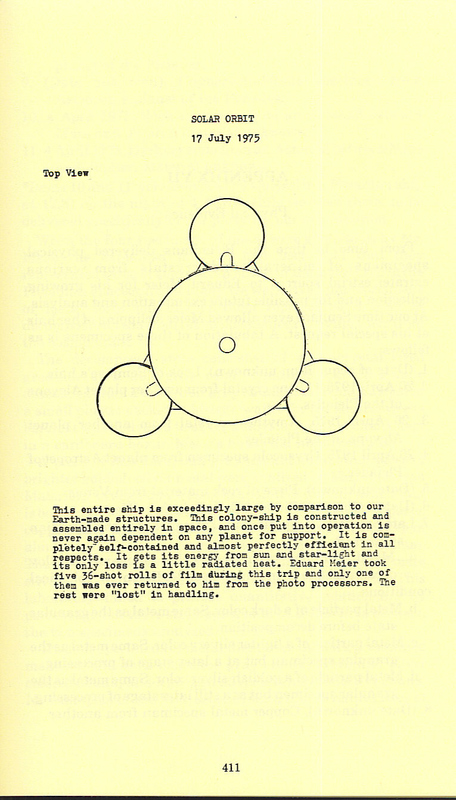 For example they still defend the Apollo-Soyuz set pictures, which Meier claims were photographed by him on July 17, 1975 even though we have conclusively demonstrated that the Apollo and Soyuz spacecrafts which Meier supposedly photographed were considerably different in design to those of the real spacecrafts (ironically, claimed to have been designed under the ‘utmost attention and all sorts of supervision’ of the Plejaren) that went up in space, not to mention the fact that these pictures turned out to be frames from the NASA animation likely broadcasted years before. Moreover, the alleged spacecrafts that appears in Meier’s other photos from the same set, were not even in space on that day or year but were in space only several years before. Besides, these images also ultimately turned out to be frames from the Soviet documentaries from 1969 and 1972, featuring model-simulations. We have contacted Michael Horn multiple times (in July 2015) and asked him to cite the source in support of his statement, where he mentioned that ALL the pictures, after being published in PPKBs and Und sie fliegen doch! books, have been considered by Meier and FIGU to be ‘suspect and unreliable.‘ So far, Michael has ignored all of our emails. Note (August 3, 2015): Michael did finally respond personally on facebook on August 1, however his response is similar to that of his August 2014 article. And when, we AGAIN brought the information and the pictures published in PPKBs and Und sie fliegen doch! to his attention, he stopped responding altogether. As a side not, Michael also posted a part of his response on FIGU Forum on the same day and when we tried to post the objections by citing the information and the pictures published in the above books, they weren’t published (also Michael’s post was later deleted) by the moderators of the forum. The reason they cited AGAIN is Plejaren’s advice from CR 486, as mentioned earlier. Besides a couple of sentences that are pertinent to the topic on space pictures, the rest of this Michael Horn’s extensive article contains – ad hominem attacks (lots of them), red herring, circular reasoning and several misleading and unsubstantiated claims – which other than being disruptive and diversionary, adds nothing to support his argument. A striking example of pseudoscientific reasoning put forth (here, here, here and here) by Meier, FIGU, Michael Horn and their supporters – in response to Asket-Nera exposé – is that if Meier or his accomplices had taken photographs from TV, then when enlargements were made of these space photos, one should be able to see the 3-color grid of the cathode ray tube, which would show the colors blue, green and red arranged in three round or square colored light dots. And the reasoning (CR 264) according to them, for the absence of these colored dots in the Asket-Nera photos is that they haven’t been photographed from TV but were extracted directly from the film footage, by MIB. “I too use to take pictures from the TV screen back in the old days when there were no video recorders available. When I did this initially – around 1969 – I was using an EXA reflex camera. I got fairly good pictures but soft images. They were never perfectly sharp because I hand-held the camera and did not set focus properly but I did not see any lines. But in later years, around 1976, I got a Nikon FM and then I was getting very sharp images but also sharp scan lines and black strips due to the different type of shutter on the Nikon FM. This statement is further corroborated by the fact that there are dozens of space pictures (allegedly authenticated by the Plejaren in around 2001) with no visible RGB colored dots, and that are still being promoted by Meier and FIGU as genuine pictures photographed by Meier during his space travels, even though they have been proven to be indisputable fakes (ex: Apollo-Soyuz, etc.). In this example, we shall discuss one instance of how FIGU carefully cherry-picks only a certain statement(s) from skeptics critique of space photos that can be easily refuted and addresses only those instead of the addressing the center point of the argument. FIGU core group member and SSSC facility director Christian Frehner has published an article – Die Intrigen des Kal K. Korff – in FIGU Bulletin 14 (Feb 1998), in response to Kal Korff’s 1995 book Spaceships of the Pleiades. On page 5 of the article, as mentioned earlier, out of 9 different sets of Meier’s space photos Korff had negatively reviewed, Christian only addressed and shoddily defended the alleged authenticity of one set (Ring Nebula) and totally ignored the rest. And even in that response, Christian has evaded the main point of Korff’s criticism, which is, why does Meier’s picture, which he claimed to have been taken when he was relatively close to the Ring Nebula or M57 (about 1 light year across and around 2,300 light years away from the Earth), matches perfectly with those of Earth based astronomy pictures.